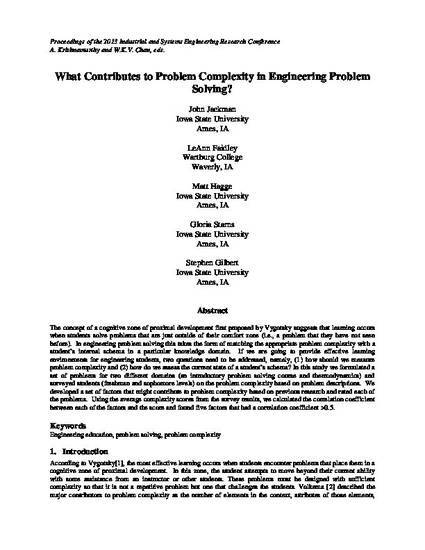 What Contributes to Problem Complexity in Engineering Problem Solving? The concept of a cognitive zone of proximal development first proposed by Vygotsky suggests that learning occurs when students solve problems that are just outside of their comfort zone (i.e., a problem that they have not seen before). In engineering problem solving this takes the form of matching the appropriate problem complexity with a student’s internal schema in a particular knowledge domain. If we are going to provide effective learning environments for engineering students, two questions need to be addressed, namely, (1) how should we measure problem complexity and (2) how do we assess the current state of a student’s schema? In this study we formulated a set of problems for two different domains (an introductory problem solving course and thermodynamics) and surveyed students (freshman and sophomore levels) on the problem complexity based on problem descriptions. We developed a set of factors that might contribute to problem complexity based on previous research and rated each of the problems. Using the average complexity scores from the survey results, we calculated the correlation coefficient between each of the factors and the score and found five factors that had a correlation coefficient >0.5. This proceeding is published as Jackman, John K., LeAnn Faidley, Matt Hagge, Gloria Starns, and Stephen Gilbert. "What Contributes to Problem Complexity in Engineering Problem Solving?" In Proceedings of the 2013 IIE Annual Conference and Expo. May 18-22, 2013, San Juan, Puerto Rico. Posted with permission.